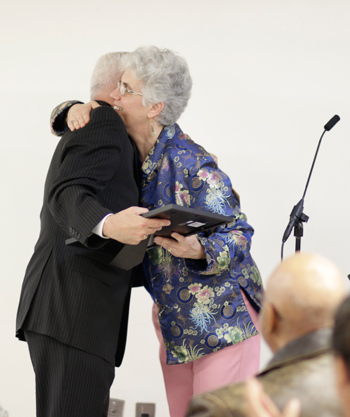 Presenting the award was Rosemarie Pace, director of Pax Christi Metro New York. “There seems to be no one you neglect,” she said, reading from the plaque given to Father Gargani. Father Gargani, 70, was professed in 1965 and ordained a priest in 1971. 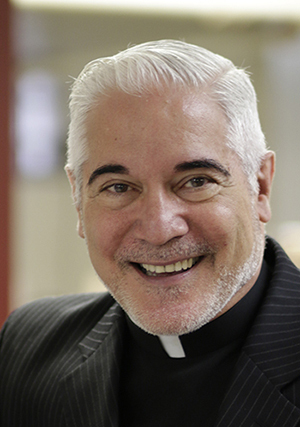 He is rector of the Redemptorist community in Brooklyn. Also recognized during the Peacemaker Awards Reception were Sister Evelyn Lamoureaux, D.W.; Phyllis and Orlando Rodriguez; and high-school students Caroline Bandigan, Jillian Eberlein, and Paul Thomas. Father Matthew Allman, C.Ss.R.—vocation director for the Redemptorists’ Baltimore Province—played classical guitar as part of the evening’s entertainment. The list of friends and colleagues he thanked and praised encompassed sisters, priests, and lay Catholics as well as poets, dancers, and lovers of the earth. To learn more about Father Gargani and his ministry, click to read a recent interview with him conducted by Sister Camille D’Arienzo, RSM, and published by National Catholic Reporter.